A couple of weeks ago I found myself in a unique position: Someone who wanted to work with me asked me to justify my worth. This was the first time this had ever happened to me – I’d never been asked to justify the fees that I charge. And the thing is, I was perfectly confident about doing so. Had I been asked three or four years ago, I wouldn’t have known what on earth to say or how to respond. The confidence I have in my ability to produce great content – and to do it professionally – is something that every now and then surprises me (in a really good way). I’ve learnt through bitter experience that for a long time I totally underestimated my worth. Yet this doesn’t apply to just my blogging career, but to many of the jobs I had that led up to me going full time as a professional blogger. And it’s something that I think too many of us do. It’s even worse when we consider than women are still being paid less than men for doing the same jobs in many industries. I was contacted by a PR person who wanted me to get on board with a particular campaign she was running for a brand. (It doesn’t matter what the campaign or the brand were, it’s not relevant.) She outlined the project and asked for fees, which I gave her. I listed the fees that I’m currently being paid by other brands for equivalent work, so I knew for a fact that those fees were what I’m worth (to a brand). Here’s the rub: She replied asking me to explain why I’m charging so much more than my contemporaries. I explained things that she should really have known already (if she’d done her research) about my stats, successes with other campaigns, my UK Blog Awards win, etc. I said perhaps it’s not that I’m overcharging, maybe it’s that the other influencers are not charging enough. This is something that all too often is not the first thing that PRs think of. Blogging is a very, very new profession, after all, and bloggers are generally in the dark about what to charge companies (usually not enough). I very politely declined to go any further with the campaign and stopped short of telling her what I thought of her asking me to do her job for her (it’s HER job to pitch me to the client and justify why I’m worth what I charge… She found and approached me, after all). I’m lucky compared to a lot of bloggers: I’ve had an agent who helped me see what I was worth by quoting on my behalf. It’s a lot easier to have the confidence in yourself when someone else is doing the negotiating. What do I charge? I charge what brands are willing to pay me. In other words, the way to know whether what you charge for your services – and this applies to ANYONE who charges fees for a service or products – is by putting up your prices. If everyone happily pays you those fees, then you’re still charging too little. If no one pays you those fees, you’re charging too much. WHAT YOU WANT ARE GOLDILOCKS RATES: RATES THAT SOME PEOPLE CAN AFFORD AND HAPPILY PAY BUT THAT ARE TOO HIGH FOR OTHERS. What you want are Goldilocks rates: Rates that some people can afford and happily pay but that are too high for others. This is the way you stay in high demand – those that can’t afford you but are desperate to work with you or hire you for your services will look for some way to be able to pay you what you’re worth. I strongly believe that too many of us are afraid of charging what we’re worth. I did, many times: when I look back on what I was charging brands in the early days I could kick myself for charging too little – I know because they accepted my rates far too readily. I was afraid of putting them off, afraid of them thinking I was too big for my boots. I know better now and have no qualms about quoting my fees and knowing they may (or may not!) be able to afford me. 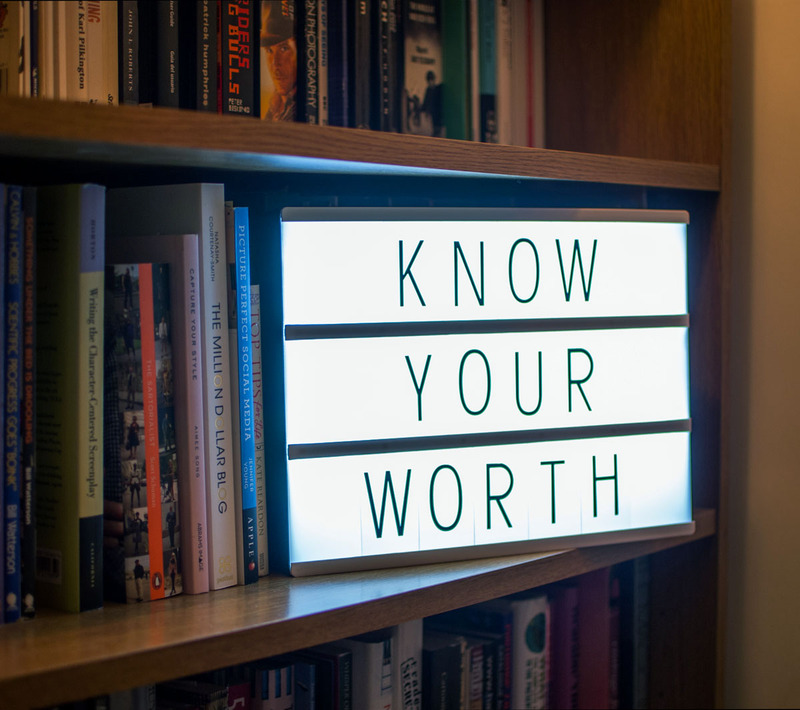 So whatever you do in life – whether you are self-employed, an employee, a freelancer, someone who bakes cakes for friends and family or walk dogs now and then for some extra cash – make sure you don’t underestimate your worth. If you find that people are all too happy to pay you what you charge them, put your prices up at the end of the year. Those that can’t afford you won’t be able to pay. But you’ll be making more money by having put up your prices, but your workload is less. If you’re an employee ask yourself if you’re being paid what you’re truly worth. Have you found out if there is equal pay amongst the male and female colleagues in your company? This is a hot topic right now, so be brave and just ASK. If you’re a blogger, ask others what they charge. If they won’t help you, find someone who will. I think it surprises a lot of people that there ARE bloggers out there who turn down paid projects. Yes, it can be hard to keep saying no to a brand that offers you 25% of what you quoted or what you’d originally agreed upon (as has happened to me – and more than once or twice) if you really need the money. I regularly say no to paid projects because they either don’t fit my brand or they can’t afford me. IT’S NOT ABOUT RACING TO THE BOTTOM ALONG WITH EVERYONE ELSE. IT’S ABOUT KNOWING YOUR VALUE. Can you imagine the harm discount codes would do to a brand like Chanel? You never see big sale signs in designer stores because it would do their brand more harm than good to suddenly drop their prices. Consumers would no longer see them as a luxury brand – they’d become a discount brand. Going back to the Goldilocks rates… think how many women save up for a Chanel handbag. I said “those that can’t afford you but are desperate to work with you or hire you for your services will look for some way to be able to pay you what you’re worth”. Chanel handbags ARE worth it to some women. So they (hypothetically) beg, borrow and steal to be able to afford to buy one. Chanel don’t drop their prices – those who want a Chanel handbag find a way to afford one. I gladly gave up that campaign offered to me by that jobsworth PR even though she may have accepted my fees in the end. But if she couldn’t already see that I was worth what I was charging, then that wasn’t the campaign for me. If you think about it, that thought process can be applied to an awful lot more in life than just monetary worth. Know your worth in every aspect of your lives, ladies. You deserve every bit of it. – Why Do Some People Resent the Success of Others? – Isn’t It Time Blogging Was Taken Seriously as a Profession? This is so true. It’s the difference between being 99p store or Harrods. Why work harder for less? In my day job as a beauty therapist this equally applies. I found that once I got the confidence to put my prices up I actually got more clients. You always will get the odd cheeky one who want you to justify yourself, or barter and I say (politely) jog on! A big yes to this! We are so valuable as influencers and I feel like the brands and PR companies get quite a deal working with us. I've gotten much choosier this last year and it feels really good. Excellent post and excellent timing. It's so easy to undervalue yourself and feel a lack of confidence to stand up for yourself with brands. Thanks for the pep talk. What an excellent post! I pinned it for future referrence. Thank you so very much for hosting Catherine. Thank you Catherine. Once again you tell a truth and inspire. Surprisingly a male colleague confided in me recently that he feels undervalued as he'd seen comparable roles paying more in the company. Gosh I think it's surprising hearing that from a male colleague, Anna… we're so used to being informed that women are often paid less we forget that sometimes it happens to men too! I hope he speaks out and confronts your employer…! I love this post! As a lawyer, we come across this often, and I don't change my prices regardless. I've even heard people say: X lawyer charges X (high rate), so they must be good at what they do. So, we have to keep in mind that a lot of people have that mentality. I agree, you must know your worth! SO glad to hear that, Julie!! It's so, so true about looking "cheap" (for want of a better expression…! I am slowly figuring out my worth…. and enjoying turning down crumb chuckers…. $50 and a shout out on social. However, I still get very excited when I'm gifted something truly beautiful, and will also happily work for gifted-only items for smaller brands. I am still completely in love with this blogging business, any money is a great bonus but we have to be careful to stick to our true selves, don't we? No point in making a mint cheering for something we don't even like just because someone offered us £500 to do it. I love the way your collaborations always fit you and your personal style. I NEVER look and think "Yeah right, give me a break Catherine!". Thank you also for "believing" in me and seeing that my chosen collabs fit my style, that means an awful lot. You'll be way ahead of me of where I am after six years of blogging my lovely, I guarantee it!!!!!!! What a great post! And timely one for me. I have just had a very pleasant back and forth negotiation with a client who has ordered two of my large handmade mirrors with the possibility of more. I was able to communicate confidently about my product which I have spent time developing and polishing (no pun intended!). Me as customer: How much is this glass sun catcher mobile? My friend as me: It's thirty euros. Because what *I'd* been doing when people asked was going into a song and dance over how much work I'd put into it, instead of simply giving the price. But it took another person to see it. From then on I wouldn't justify the prices I set (although I would happily explain the process of making a piece, so long as the tone was inquiring and not accusing). Incidentally, many years before when the same friend was still living in Scotland, she'd undervalued her worth as well. She used to make amazing puppets out of papier mache by hand with moving parts, woollen hair, outfits (she'd sew them herself!) and expressive, painted faces. One day she told me a potential customer had asked her to do one, a custom one at that, and my friend was worried that quoting £50 would be too much. I was shocked as they could easily have been triple the price (it was the '90s, but it was still an exclusive handmade item). I'm aware of just how much work I put into my products and am now bolder about speaking up. And while I'm flexible with discounts if there's a big, multiple order, I set prices that I'm happy with. I'm also aware that previous customers have paid x amount for a painting or piece of glass work which has already established my worth. Oh, and I forgot to mention when I did turn down a commission. A colleague at my English teaching school was getting married. She was interested in my handmade cards as invitations, so we set up a meeting (she was in management, hence far better paid than we lowly Tefl teachers!). Although my cards may come across as quite pricy, they are all individual pieces of work, plus naturally I offer a better price if I sell a pack of three (for example). So she was aware of what I charged from the off and that I used quality products in my work such as screen-printed Japanese paper (chiyogami). She would also want me to print the invitation on the inside of that card or find a way to attaching an extra layer with the text, plus word it. I offered her a good deal on one hundred cards, one that I was happy with. But she and her fiancé wanted to pay a ridiculous amount per card. They'd arrived at that number by checking Ebay where yes, craftspeople may be severely undercutting themselves plus not using decent materials. I won't skimp on materials as that would reflect badly on me and I won't make a pig's ear of the work I put into it. The old me would've felt peeved I'd been offered so little and that she'd had the gall to ask in the first place. But the real me simply explained that clearly neither of us would be able to compromise and wished her luck. Did I think she has a damned cheek? Absolutely, but I walked away with my head held high. Gosh Emerald what a fantastic comment, you sure know your stuff and it's BRILLIANT to hear that you don't undercut yourself or devalue your product!! I don't think anyone should ever worry about charging too much, I did that in the past with campaigns and I now know I could (should) have charged 8-10 times as much. Having confidence in yourself is everything, hon – remember that YOU have something that THEY want, so if they've approached you then it's you that has the upper hand. If you ever think that they've asked a bit too much, then they've asked WAY too much! This is all new to me, I've just started getting items sent to me, let alone being paid – I can only hope to carry on and get that far. It's a big learning curve and I thank you for all your information you post, it's very helpful. x Jacqui mummabstylish. …no truer words have ever been stated so eloquently! You have always helped me to know my worth and for that I will always be truly grateful. This is an ongoing hot topic and as long as others continue to undervalue and underprice themselves, there will be no solution! Thanks Ashley my lovely, and right back atcha with truer words never said: "as long as others continue to undervalue and underprice themselves, there will be no solution" – you are SO right!!! Catherine, thank you so much for sharing this post. As a blogger only 2 years in (which I think is still considered a new blogger), I am still struggling to find and define my own worth. I like this perspective very much and appreciate that you have shared it with us. Your response to that PR was spot on! I've turned down several collaboration offers recently because they were offering way too little. A couple of years ago I'd have been reluctant to say no but now I don't hesitate if they're taking the you-know-what. When I see blogger opportunities posted in Facebook groups for a pittance of a fee and loads of comments in response it makes my heart sink. Blogging will only be taken seriously as an occupation when bloggers know their worth and stick to their guns. You really know how to get to the meat of a subject, Catherine! And how can there be one fee or worth? Because we are all a little different, in different places and have different readers! But it certainly is a tad stressful to figure out what is a good fee. In a way, it's just like life. You have to travel the road and see where it takes you!! Thanks, and have a fabulous weekend!! ps..and of course you should be charging more—-you're a rock star!!!! You're right it IS hard to figure out what a good fee is Jodie – that's why I think it's so important for bloggers to help other bloggers and share what we charge. After all, we're only doing ourselves a disservice by not helping others, it means they end up charging a lot less and then brands think they can pay us less…! I AM GIVING YOU A STANDING OVATION BECAUSE EVERYTHING YOU HAVE SAID IS 1000% TRUE!!!!!!!!! Brands/PR companies will try to get over on you in many instances, it is so important to stand your ground- of course this is easier said than done.